Ongoing project since 2004. 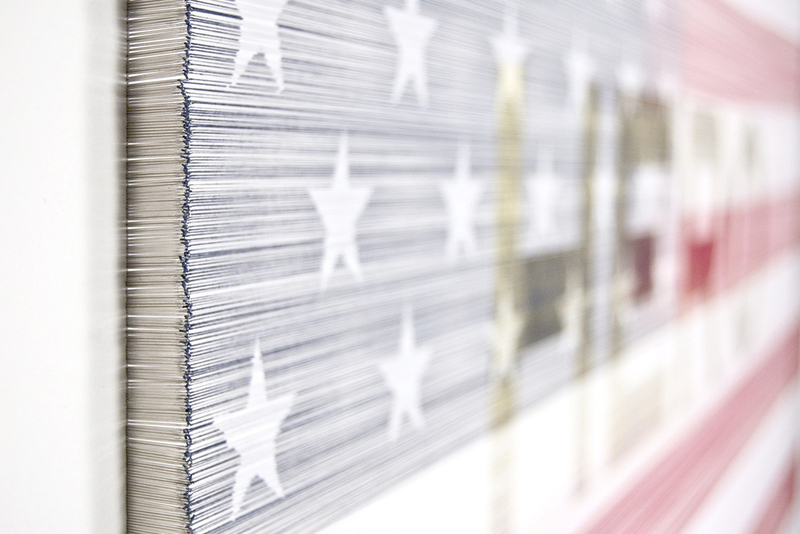 Americans flags unwoven string by string and reassembled as two separate flags made only of the vertical (warp) and horizontal (weft) strings respectively. The end of each string is threaded through a needle and pined back into registration. 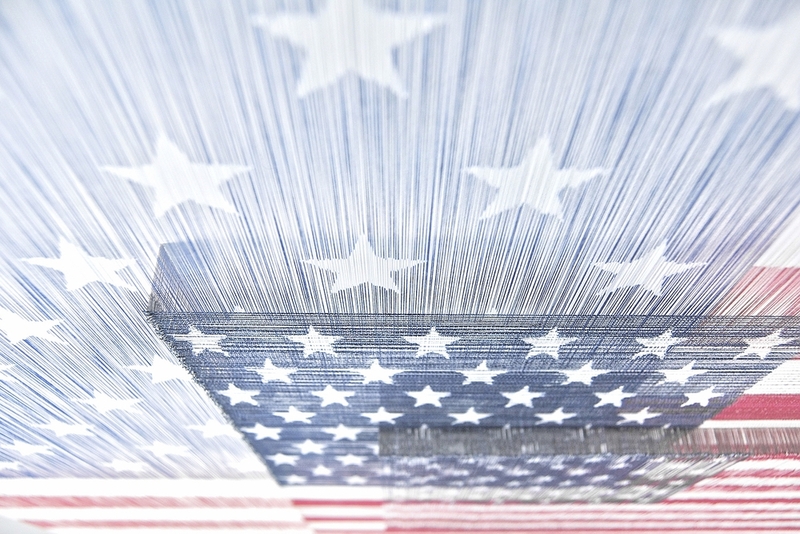 Three unwoven American flags pinned with needles at three different depths, allowing the strings to visually reweave in an increasingly smaller unified area. These unwoven strings form a comparative graph of wealth disparity from 1905-2015. It is interesting to note that the height of the disparity in 1929 and 2008 was just about at the same point before a financial crisis occurred. Based on historical trends and human nature, the last 5 years are theoretical projection. These words are taken from old Western movie titles, iconic words from the American narrative. 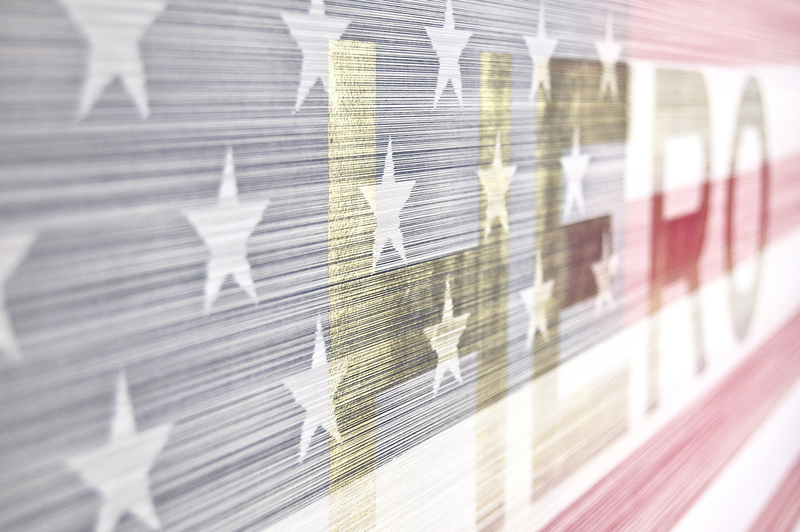 As the growing social, political and economic polarization has unfolded - culminating in the 2016 election - it has felt like a slow motion unraveling.These works attempt to understand the rift in the mythic social fabric of American society, when heroes have been hard to find and many feel hostage to unseen forces of economics, race, gender, class and outdated ideologies.